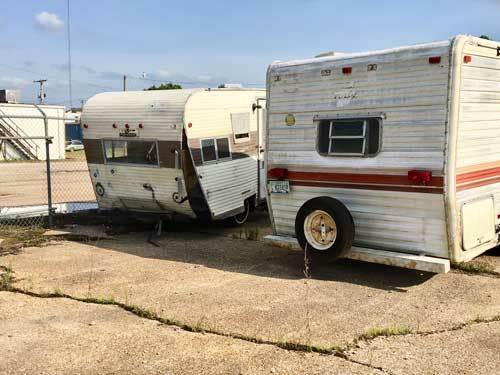 These badly damaged travel trailers have accumulated during recent days on the same downtown property from which more than 100 junk motor vehicles were ordered removed last year. Several old travel trailers have accumulated on the same downtown New Albany property from which 100 junk cars were removed last year. Most of the old travel trailers parked downtown have damage of similar severity as this one. The trailers, some severely damaged, are parked next to the fence on the Snyder Street property, and are only a few hundred feet from the intersection of Bankhead and Main Streets. In January of 2017, more than 100 old automobiles and small trucks had accumulated on the same property. The City Code Enforcement Officer ordered them removed under section 10-97 of the New Albany City Code. The order last year went to Jimmy Grubbs of Blue Springs. Most of the old motor vehicles had been removed by mid-March last year. The owner or person responsible for the old travel trailers has not yet been officially identified. City officials are investigating. New Albany needs to get off there high horse and go back to the good small town it once was. There are to many stupid codes now for the city.